James Hardie made choosing the right siding easy. Now, HomeShow Radio makes choosing a qualified contractor easy. Select one of our pre-screened HomeShow Hardie Pros, siding contractors with verified track records of excellence in the installation of James Hardie siding with ColorPlus technology. It gives your home a long-lasting finish. 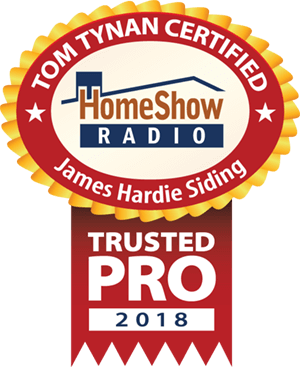 Serving the Greater Houston area and using James Hardie building materials, HomeShow Hardie Pros are certified by HomeShow Radio’s Tom Tynan. •What happens when Hardie siding is installed wrong? • Do hidden costs of wood siding make Hardie siding a better choice for your. • Right siding. Wrong siding contractor. What happens next is a disaster.